It's obvious to see why Andy and Larry Wachowski were drawn to the graphic novel V for Vendetta. It's themes of an overpowering totalitarian government is similar to themes they explored in their Matrix trilogy. Unfortunately it also gives them a chance to over-pontificate to the point of boredom, similar to what they did in Matrix: Reloaded. The Wachowskis adapted the graphic novel written by Alan Moore and illustrated by David Lloyd. Moore hated the film enough to have his name removed from the credits. However, Moore, a comic book legend, has been extremely annoyed with how Hollywood has handled all his work (including From Hell and The League of Extraordinary Gentleman). 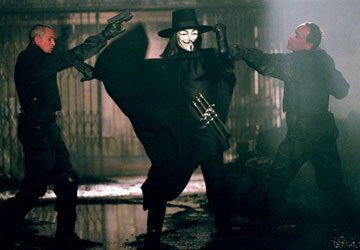 V for Vendetta takes place in a futuristic Britain ruled by Adam Sutler (John Hurt, Manderlay, The Skeleton Key). Freedom is limited, and the citizens live in fear of roving bands of government agents who have free reign to do whatever they see fit. They are the law, so what they say goes. Evey (Natalie Portman, Star Wars Episode III: Revenge of the Sith, Closer) is one of the citizens caught for being out after curfew. V (Hugo Weaving, The Return of the King, The Matrix Revolutions) rescues her, only to hold her prisoner. V is trying to ferment an uprising against the government. He walks around dressed in black with a Guy Fawkes mask. He also has a nasty habit of throwing knives and surviving gunfire. The directing duties went to James McTeigue, who worked extensively with the Wachowski brothers in the past. V for Vendetta shows many of the same tricks and visual flairs used in the various Matrix films, but is limited by its setting. The movie needs to ground itself in reality, so its vision of the future must look a bit like the world does today. McTeigue is able to create a bleak world that is dark and forbidding, but cancels this out with too much preachy dialogue that seriously drags V down. This is disappointing because V for Vendetta does have some interesting ideas, something so few movies have these days. But there is so much exposition and so many things going on that everything is muddled. It doesn't help that nearly every movie that takes place in the future nowadays has some sort of rebellion against a corrupt government (Ultraviolet and Aeon Flux both came out within the last few months). So although there are plenty of explosions and violence, V strangely turns out inert and a bit dull. 2 hours, 12 minutes, Rated R for strong violence and some language.